The papers highlighted in this Journal Watch include an analysis of the economic burdens of diabetes projected out to 2030, which is a great resource for public policy and planning localized expansion of programs based on these conservative estimates. The ODYSSEY DM-DYSLIPIDEMIA trial is an important demonstration of not just safety but also efficacy in lipid lowering in those tough patients with Type 2 diabetes mellitus and mixed dyslipidemia who are not at goal on maximally tolerated statins. The FREEDOM-1 trial is included because it demonstrates that a three- to six-month implant can effectively improve glucose control in Type 2 diabetes. Lastly, cystic fibrosis-related diabetes (CFRD) is addressed with a study showing that oral repaglinide has no benefit over the current standard of care, which is insulin, in a two-year study. Study Design: The authors modeled the absolute and gross domestic product (GDP)-relative economic burden of diabetes in individuals aged 20-79 years using epidemiological and demographic data, as well as recent GDP forecasts for 180 countries. They assumed three scenarios: prevalence and mortality 1) increased only with urbanization and population aging (baseline scenario), 2) increased in line with previous trends (past trends scenario) and 3) achieved global targets (target scenario). Results: The absolute global economic burden is estimated for 2015 at $1.3 trillion (95% CI 1.3-1.4) in 2015. Depending on the model, it will increase to $2.2-2.5 trillion by 2030. This translates to an increase in costs as a share of global GDP from 1.8% (1.7-1.9) in 2015 to a maximum of 2.2% (2.1-2.2). Summary: This paper estimates the absolute global economic burden of diabetes in U.S. dollars in 2015 and then develops projections through the year 2030. This information is valuable to clinicians and health policy-makers. The figures provide an excellent visual representation of the current and projected burden of diabetes. The current burden is staggering and likely to increase faster than the near-doubling over 15 years that is projected here. Although progress has been made toward early diagnosis, prevention strategies must start prior to the onset of “prediabetes” to truly impact the growth in this epidemic. Intervention: Alirocumab 75 mg subcutaneous (SC) injection every two weeks (Q2W) added to insulin or other antihyperglycemic drugs, stable maximally tolerated dose of statin therapy without other lipid-modifying therapy (LMT) for 24 weeks. Alirocumab dose up-titrated to 150 mg Q2W from week 12 when non-high-density lipoprotein cholesterol (non-HDL-C) levels ≥100 mg/dL (2.59 mmol/L) at week 8. The usual care (UC) group continued on insulin or other antihyperglycemic drugs, stable maximally tolerated dose of statin therapy without additional LMT or with either ezetimibe, fenofibrate, omega-3 fatty acids or nicotinic acid as per Investigator’s judgment for 24 weeks. Results: In all, 413 individuals were randomized, with 276 in the alirocumab group and 137 in the usual care (UC) group. 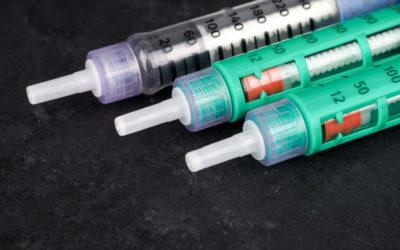 At baseline, 77% were treated with a biguanide, and 37-40% were treated with insulin. HDL-C levels were not low at 40-41 mg/dL. Triglycerides (TGs) were mildly increased at 212-215 mg/dL. In all, 63.6% were maintained on 75 mg every two weeks of alirocumab, while 36.4% required uptitration to the 150 mg Q2W therapy. At week 24, the mean non-HDL-C reductions were superior with alirocumab (-32.5% difference versus UC, 97.5% confidence interval -38.1 to -27.0; P < .0001). Alirocumab significantly reduced LDL-C (-43.0%), apolipoprotein B (-32.3%), total cholesterol (-24.6%) and LDL particle number (-37.8%) at week 24 versus UC (all P < .0001). Alirocumab was not superior to UC in reducing TGs. The authors do point out that because of the hierarchical nature of testing, the significant increase in HDL-C levels (+6.2%) and significant reductions in LDL particle number (−37.8%) and LDL particle size (−1.8%) relative to UC should be considered nominal. Alirocumab was superior to fenofibrate in reducing non‐HDL-C (33.3% versus fenofibrate), ApoB (35.2%), Lp(a) (22.8%), total cholesterol (25.3%) and measured LDL-C (55.7%). At week 24, the percentage change from baseline in the fenofibrate group was equivalent to the alirocumab group in lowering TG and raising HDL-C, when added to maximally tolerated statin therapy. The incidences of treatment-emergent adverse events were 68.4% (alirocumab) and 66.4% (UC). No clinically meaningful effect on A1C or change in number of glucose-lowering agents was seen. Summary: This study shows that in patients with Type 2 diabetes mellitus and mixed dyslipidemia, the addition of alirocumab to maximally tolerated statin therapy decreases LDL-C, non-HDL-C and TC, thereby getting more patients to their lipid targets. Because this study was not designed to assess cardiovascular (CV) outcomes, it is not possible to compare CV events or mortality between the two groups. However, with the significant residual CV risk for patients with Type 2 diabetes mellitus, these data provide an option to further decrease lipids with a goal of decreasing the devastating CV events that are the leading cause of mortality in people with diabetes. Results: ITCA 650 is a subdermal osmotic mini-pump that continuously delivers exenatide subcutaneously for three to six months. The first paper from the FREEDOM-1 Trial describes the phase 3, double-blind, placebo-controlled trial that randomized 460 patients for 39 weeks of treatment at 40 or 60 mcg/day. The change in A1C was -1.1% for ITCA 650 40 mcg/day versus -1.2% for ITCA 650 60 mcg/day and -0.1% for placebo. Both doses of ITCA 650 were statistically significant compared with placebo. Greater A1C reductions occurred in patients not receiving sulfonylureas (SUs) versus those receiving SUs (-1.7% versus -1.2%). Each group was assessed to see if A1C attained target of <7% with 37% in the ITCA 650 at 40 mcg/day and then 44% of ITCA 650 at 60 mcg/day and 9% in the placebo group. Change in body weight was greater with the study drug and significantly different from placebo: -2.3 kg ITCA 650 at 40 mcg/day, -3.0 kg for ITCA 650 at 60 mcg/day and -1.0 kg in the placebo group. Nausea was the most common adverse event and subsided over time, with 7.2% in the ITCA group versus 1.3% in the placebo discontinuing because of gastrointestinal side effects. The second paper describes the poorly controlled patients with Type 2 diabetes who were ineligible for participation in FREEDOM-1 because of severe hyperglycemia with A1C >10%. This was a 39-week, open-label, phase 3 trial that enrolled patients ages 18-80 years with A1C >10% but ≤12% and BMI 25-45. There was no placebo group due to the severe hyperglycemia. Participants received ITCA 650 20 mcg/day for 13 weeks, then 60 mcg/day for 26 weeks. The primary endpoint was change in HbA1c at week 39. Baseline A1C was 10.8% with a mean reduction of -2.8% at week 39. Weight loss was -1.2 kg (P = 0.105). In all, 25% of patients achieved A1C <7%, with 90% decreasing their A1C by at least 1%. Only four patients (6.7%) discontinued for gastrointestinal side effects. Summary: These data show that ITCA 650 is well tolerated and significantly reduces A1C and weight compared with placebo. It is concerning that the subset not on SUs responded better than those on SUs because many patients still receive SUs as their first- or second-line therapy. The companion paper showing treatment of those with A1C of 10-12% demonstrated an A1C drop that would bring that population to an A1C of approximately 8%, which would be very helpful in many of our uncontrolled Type 2 diabetes patients. These two studies demonstrate the safety and efficacy of this new delivery system for exenatide that could be inserted during routine clinic visits every three or six months once it is approved by the U.S. Food and Drug Administration. Sponsor: Mukoviszidose eV, Vaincre la Mucoviscidose, ABCF Association, and Novo Nordisk. Secondary Outcomes: Mean change in A1C from baseline to 12 months of treatment, mean changes in BMI Z score, FEV1 and FVC from baseline to 12 months and 24 months, and changes in blood glucose profiles during the intervention. Results: There was no difference between groups in absolute A1C values at baseline, 12 or 24 months. There was also no change in mean A1C from baseline to 12 or 24 months. The mean final daily dose of repaglinide was 2.6 mg/day (range 0.5-12.0), and that of human regular insulin was 18.6 IU/day (range 4.5-72.0). A significant change in BMI Z score was seen after 12 months, but not after 24 months. Changes in glucose profiles and in percentages of predicted FEV1 and FVC did not differ between groups after 12 or 24 months. The most frequent adverse event was pulmonary symptoms. Symptomatic hypoglycemia was reported in 44 (64%) of the 69 patients and was equal in both groups (22 per group). The only severe hypoglycemia was one person in each group having an episode requiring assistance. Summary: The two-year duration of this study is valuable as prior data were up to only 12 months. However, as clearly reviewed by the accompanying editorial, it is not sufficiently compelling to change standard of care from insulin to repaglinide.